Amazing talent, loads of mental fortitude, weapons feared on the tour, and excellent movement and speed can be doubly amplified and exponentially productive with the correct mindset. In the very end a player’s playing style is a product of his mindset. 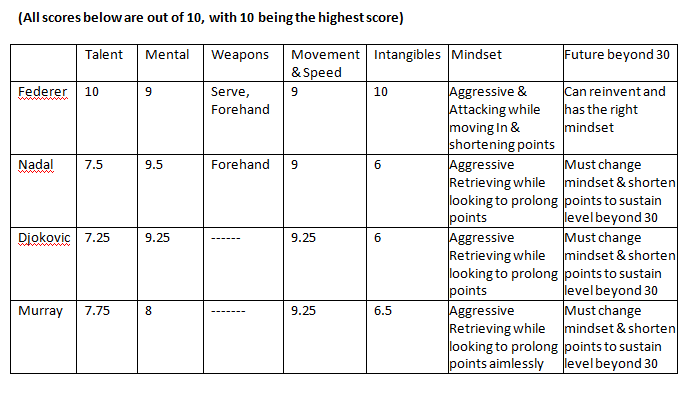 No one can be certain about what the correct mindset of a tennis player should be but as of now it seems that an aggressive mental makeup which is pliable enough to be controlled appropriately can yield astonishing results and help prolong life as an active player. Quite a few other factors such as good genes, good health, insatiable love and excitement for the game, and so on and so forth also contribute towards extending a player’s life on the tour but it’d be impossible to cover them all in this blog so we’ll stick to just the mindset here. Federer: If mindset could be classified as a weapon then Roger’s highly aggressive mindset is perhaps his WMD. Federer can defend but he’d rather attack, he can prolong rallies but he prefers to cut them short. After two hours against Nadal or Djokovic the opponent feels all hope being sucked out of his being whereas Federer, when firing on all cylinders, doesn’t even offer that hope to the opponent, he simply dazzles the opponent into submission, admiration and a quick trip back to the locker room. His mindset to cut points short and his ability to do so has helped to keep him relatively injury free by keeping that mileage lower than what it should have been had he also had the mindset to prolong points like Djokovic, and Nadal. It is his aggressive mindset which compels him to be proactive, take matters into his own hands and dictate points rather than wait for an error from the opponent. However, his match-up disadvantage against Rafa made him doubt his playing style a little and Roger started to stick behind the baseline a little more, chip too often without the intent of charging, and make fewer trips to the net. His basic mindset always remained aggressive and he still took the ball early but hesitated to exploit openings by moving forward to the net; and then around 2008 onward came the barrage of unforced errors and those forehand and backhand shanks from the baseline. 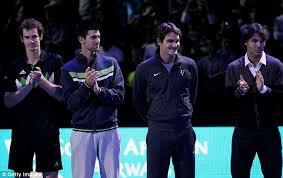 Something had to change and Federer hired the likes of Edberg to regain that edge. It took an injury time hiatus to finally rethink and retool his aggression on not just the forehand but also the backhand wing, and this time around it clicked until it needs to be retooled again. Whatever Roger does, I only hope that it is guided by and in tune with his mindset which responds well to constant & controlled aggression. Nadal: Rafa mindset compels him to prolong rallies but he truly wants to be aggressive and his Miami Open 2017 matches are proof of his diligent effort to play aggressively. However the difference between him and Roger is that he wants to be aggressive and also tries to play aggressively whereas Roger is aggressive. Therefore whenever uncomfortable Rafa reverts to his defensive best and parks himself between 5 and 10 feet behind the baseline and displays his aggression by executing unbelievable winners from there. His mindset has caused him more than his share of injuries and therefore many missed opportunities; however, his mindset is also the reason why he has won so much. As stated in my earlier post http://www.138mph.com/decoding-the-big-three-murray-part-ii/, I truly believe that Rafa has benefited the most from the general slowing down of courts and advancements in string technology and therefore his mindset to prolong rallies and the ability to convert defense into offense from the baseline was perhaps shaped by the changing times which never allowed the Roger in him to fully develop. Rafa will now have to learn to shorten points and I am already seeing that he is trying to play closer to the baseline and take the ball earlier than usual. However, the mindset will truly be tested against the likes of a Kyrgios, Del Potro or even Djokovic who carries a little more aggression from the baseline than Rafa and can also retrieve a little better than Rafa. Yes, Federer has now won the last 3 played against Rafa and may have even found the solution to his match-up disadvantage against Nadal but I am still uncertain of the status of his mental block while playing Rafa. Roger, I believe, needs to win at least 7 in a row to be cured of such a chronic malaise, and until then I’ll refuse to include him in the list of players who can make Rafa uncomfortable. Djokovic: Novak is truly a modern day’s tennis miracle. He transformed himself from someone who would retire of exhaustion half way through important matches into a reliable high quality ball machine who’d relentlessly put the next ball into play for the opponent. Novak’s game, I believe, has been shaped to overcome Rafa’s and so is his mindset. 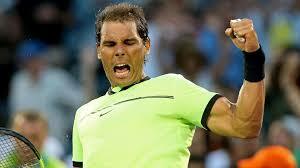 Not only can he play slightly more aggressive than Rafa but also put more balls in than him. However, Novak too has a mindset that loves to prolong points and perhaps that is an outcome of trying to beat Rafa at his own game. Novak also never felt the need to hone his net game because there really wasn’t a compulsion to do so, but I believe it’d be a prerequisite for Novak to take his game to the next level and reinvent it for his 30s. Of the four being analyzed here he is the worst at not only approaching the net but also volleying. The mindset was shaped by the burning desire to beat the best, which luckily or unluckily for him happened to be Nadal, and he felt no reason to waste time on acquiring chip & charge or volleying skills to beat Rafa on slow surfaces. Novak is well aware of that shortcoming and one of the reasons to hire Becker was to improve those weaknesses, therefore, he certainly cannot be blamed for not trying. However, it is very difficult to change ones mindset and I can only wish Novak the very best because he will certainly need those skills, if not the mindset, to thrive in his thirties. Murray: I believe Andy’s mindset is shaped predominantly by his athleticism and talent and thereby his urge to put it on display for himself, the opponent, and perhaps the spectators. In his desire to showcase his ability to accomplish just about any trick on the court he sometimes forgets the purpose and therefore lacks the aim. He can be more aggressive than Rafa and Novak and his defense is solid too but he still cannot put it together as well as they can and therefore he has only 3 slams as compared to their double digits. Murray, to me, is a better version of Monfils … a purposeless athletic genius on the court. In the following post I’ll uncover the intangibles which I believe become tangibly crucial as the player enters his thirties. This was a tough one…. It made some sense.